We just wrapped up the first full week of the 2018 General Assembly Session! Today is the deadline for introduction of legislation but so far, HBAV has identified 134 bills that have a direct or indirect impact on Virginia’s residential land development and construction industry. Stormwater management, conditional zoning, affordable housing, vested rights, building codes – HBAV is tracking bills on these issues and more to ensure that the industry’s voice is heard. Click here to view the full list of bills that HBAV is tracking for our members! Earlier this week, HBAV members from all over the Commonwealth came to Richmond to visit with their legislators about our top policy priorities. Thanks to everyone that came to Richmond and if you would ever like to schedule some time to come visit with your House and Senate representatives, please let us know! Sign up here to receive VPAP’s Daily News Updates! The General Assembly was very busy this week but much of the legislation that we are tracking will be placed on Subcommittee and Committee dockets over the next two weeks. We have received notification that one of HBAV’s top priorities will be heard in Senate General Laws and Technology this Monday! 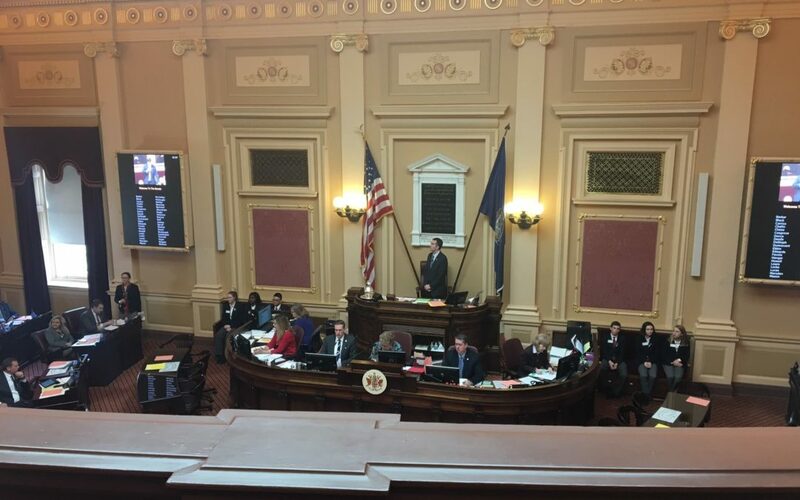 Senate Bill 488 was introduced earlier this year to transfer the authority for the adoption of the Statewide Fire Prevention Code (SFPC) from the Board of Housing and Community Development to the Virginia Fire Services Board. This bill will be heard in Senate General Laws on Monday and we could use your help communicating the industry’s position on this bill to members of that Committee. HBAV opposes this legislation because the current code development process has been extremely effective in advancing building safety and energy efficiency improvements in Virginia’s buildings. Currently, the Board of Housing and Community Development (BHCD) is responsible for reviewing and adopting the Uniform Statewide Building Code (USBC), the Statewide Fire Prevention Code (SFPC), and other codes. The BHCD consists of 14 citizen members with expertise and experience in building construction, energy efficiency, and fire safety, which allows for a vigorous and deliberate code evaluation process over the course of 1.5 to 2 years. Energy Efficiency: The American Council for an Energy-Efficient Economy’s (ACEEE) 2017 Energy Efficiency Scorecard named Virginia “Most Improved” in advancing smart energy efficiency policies and initiatives. Top Rating from the Insurance Institute for Business and Home Safety: The Insurance Institute for Business and Home Safety (IBHS) released a report in 2015 which analyzed the effectiveness of the residential building code adoption and enforcement programs of the 18 states along the Atlantic and Gulf Coasts. The report found that Virginia is the “…leader in building code safety” of those 18 states – the report also stated that “Virginia earned the highest score in the 2015 report due to an exemplary statewide code adoption and enforcement program. Please make sure to contact your representative on the Senate General Laws and Technology Committee to respectfully request that they oppose this legislation. Members of the Committee can be found here. S.B. 290 Affordable dwelling unit ordinances; expands from specific localities to any locality. S.B. 197 Landlord and tenant law; notice requirements, landlord’s acceptance of rent with reservation. S.B. 328 Common Interest Community Board; disclosure packets, registration of associations. S.B. 391 Housing; installation and maintenance of smoke and carbon monoxide alarms in rental property. S.B. 460 Professions and occupations; home inspectors; assertion as to presence or absence of radon. S.B. 743 Housing; installation and maintenance of smoke and carbon monoxide alarms in rental property. S.B. 423 Virginia Fair Housing Law; unlawful discriminatory housing practices. Feel free to contact HBAV if you have any comments or feedback on these bills! HBAV will continue to support implementation of the proffer legislation that was passed during the 2016 General Assembly Session. Several pieces of legislation have been introduced this year to amend the current proffer law or top study the impact of the legislation on Virginia’s economy. As you know, HBAV has been proactively partnering with our local Associations to open the lines of communication with local governments on how to implement the legislation and to share “best practices” from localities that have been successful in working with the law. HBAV believes that it would be premature to amend the law given that there are localities that have implemented the legislation and the fact that there isn’t consensus from local government on how to do so and given the fact that there are localities that have implemented the law. Leveraging our member’s extensive experience and expertise in a wide variety of fields is one of the most critical components of the Home Builders Association of Virginia’s legislative and regulatory efforts. The HBAV Expertise Survey is how we build our list of subject matter experts so we can quickly and efficiently send legislation out for review and comment. If you haven’t done so already, please complete the survey here. Since July 1, HBAV staff has attended 123 fundraisers for pro housing candidates seeking elected office. The HBAV Build-PAC is the vehicle that allows members to financially support the HBAV legislative efforts. Please consider a contribution to the HBAV Build-PAC that will allow the HBAV legislative team to continue to support pro-housing candidates. Click the link below to support pro-housing candidates!